In this seventh book in the popular beginning reader mystery series, Jack Jones and Bunny Brown, best friends and private eyes, help Bernard, a speedy messenger, locate his missing red whistle. 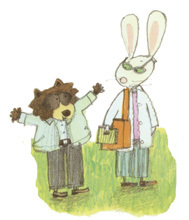 "When Bernard the bear approaches intrepid detectives Bunny Brown and Jack (Raccoon) Jones, they are recovering from a game of Slap Jack. The spirited repartee between the two almost causes Bernard to leave, but he is persuaded to explain his despair over a lost whistle, vital to his delivery service. The case is taken! Now, what is that strange noise from a wayward robin? As narrator, William Dufris sets a measured pace, enunciates well, and projects interest in the case. He personifies a dynamic quartet--a dejected Bernard, a sympathetic and clever Bunny and an excitable Jack. Dufris and the animals radiate satisfaction at a job well done."